Home Movies Review: Gumm – Could Have Been A Contender! The first film of the year is always a tricky situation in Pakistan; except for Parchi last year, every year started with a bust because it is that time of the year when the last year’s biggest flicks are still on the screen and most of the ‘audience’ is abroad enjoying holidays. Ammar Lasani and Kanza Zia would have understood that had they been pros at their game but since they weren’t, their first directorial venture Gumm crashed into a proverbial tree, just like the car in which the central character of the film was traveling. Yes, it looks a lot much like Adrain Brody’s Wrecked and I am not talking about Sami Khan’s resemblance to the Oscar winner. The TV star plays a young man who suffers from amnesia after the car in which he was traveling went off the road; a bag full of money, a dead driver and a mean-looking guy (Shamoon Abbasi) made things difficult for him, and by the time he realized the truth, the audience was either bored or had left the theatre. The back and forth transitions were too much to handle after the first one because they came as abruptly as they went. And then there was Shameen Khan who might look charming onscreen but was a misfit for the role of a mother that too of a five-year-old girl. 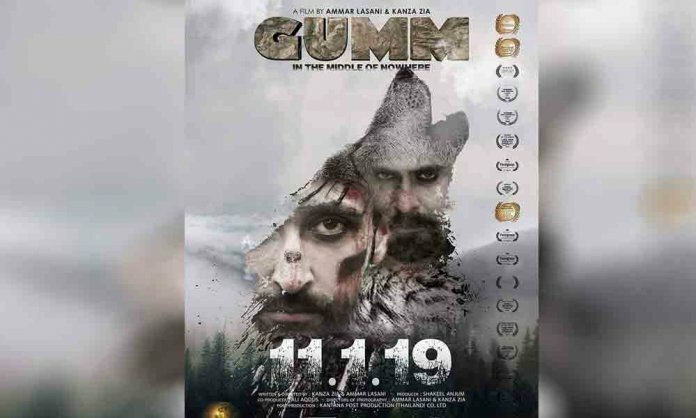 The two pluses of the film were Sami Khan’s acting and the soundtrack; Sami is still young enough to play an action hero but the fact that he didn’t have much to do except showcase his talent here didn’t help him much. He was cool in the role of a tapori while as a father looked comfortable too but sadly most of his scenes were in the jungle where he looked uncomfortable as an injured person on the run, which was quite convincing as well. As for the songs, Chashme Baddoor instantly touches the heart as does the song about the daughter but they do break the film’s momentum. It might have won awards at international film festivals but it was never going to do commercially well in a country where comedy is the new trend and thrillers are good only when watched at home, on TV. The editing was faulty, the camerawork was shaky, the stock shots were too much and the crash that started it all wasn’t filmed, making it something you can definitely give a miss. Add to that the fiasco with Shamoon’s dubbing (he didn’t dub for the movie, someone else did) and you have a film that should have stayed away from the cinema if it wanted to make it to Netflix type platforms. Now, even that seems difficult with so many controversies arising such as Shamoon’s tiff with the makers, the music director and singer’s anger over the unprofessional attitude of the makers and a hurriedly released-date knowing that handful of more films were released the same day. The film might not do well at the box office but it should act as a stepping stone for the writer-director duo of Kanza Zia and Ammar Lasani who will go home knowing more about filmmaking in Pakistan than they ever learned in New York. An original script lands in the people’s hearts in Pakistan, they can sniff a rehashed one from a trailer and give it the silent treatment it might or might not deserve. What are your thoughts about the movie? Let us know in the comments section below. Previous articleRajasthan International Film Festival 2019: Load Wedding Bags A Nomination!